I changed things around in the dining area and the living room. I took the living room curtains and rug and put them in the dining area. Then I took the dining curtains and rug and put them in the living room. Do you do that? Switch things from room to room. Here is the antique stainless steel cabinet. It sits on the opposite side of the windows. Here is an easy tip to hide a nail. Place a seashell on top of it and it instantly becomes part of the frame. I used two shells from my collection. I just placed them right on top of the nail. The beautiful girl in the picture is my daughter Chelsea. My favorite subject to photograph. We live in a coastal community, I took these pictures at the end of our road. I am open to any suggestions on how to decorate the fireplace mantel. There is a built-in to the left of the fireplace. I will share a post about it soon, this way you can see the whole thing. In the meantime if you have any thoughts about it I would love to hear them. Still love that cabinet. It's awesome! That's a great room! I love that you mixed the stainless cabinet in with the wood pieces. Your colors are so pretty too. Loving the blues and whites! Everything looks wonderful and ready for spring! Thanx for sharing at THT. Love your changes! Everything look beautiful! Love the color combo. Happy Mother's Day! There are so many great small details in this room, I love the colors you use. I will always have a soft spot for anything blue! Very pretty! I love the soothing colors! Always fun to switch things out for a new look! Love your pretty white table and your cabinet is gorgeous! Thanks for sharing with SYC. Love this room, so pretty and I love that stainless cabinet. Thanks tons for linking to Inspire Me. Love your cabinet!!! So nice you can switch the rugs and curtains from room to room, really a great idea. 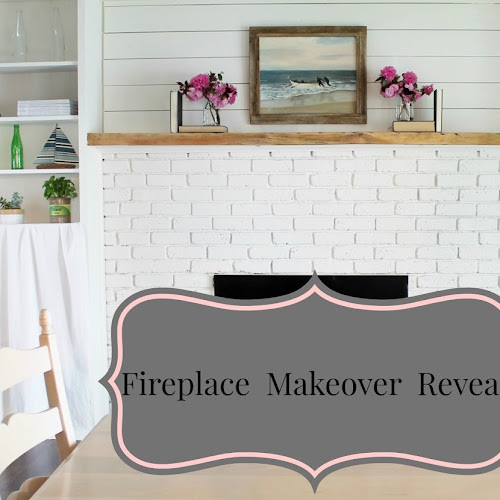 Love your fireplace, would be so pretty with a piece of beveled glass cut to fill the space above your mantle. This room is beautiful! I love the stainless cabinet— such a great touch. Thank you for sharing Julie, it looks beautiful!